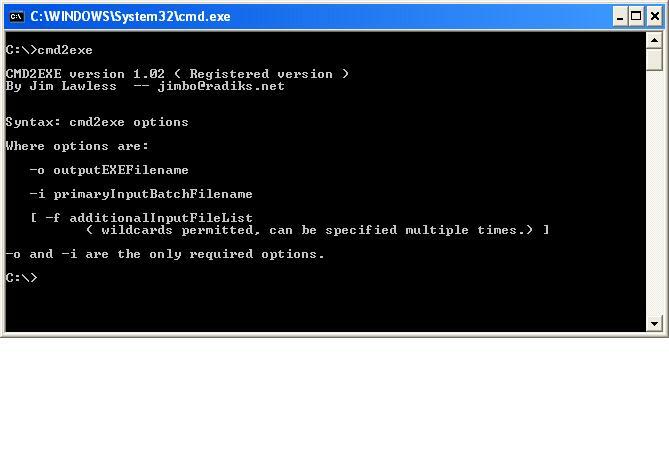 Similar to a batch file compiler, CMD2EXE can create an EXE file from one or more batch files. CMD2EXE is able to package batch files and supplementary resource files ( EXE, WAV, GIF, JPG) into a single EXE. Similar to a batch file compiler, CMD2EXE can create an EXE file from one or more batch files. CMD2EXE is able to package batch files and supplementary resource files ( EXE, WAV, GIF, JPG) into a single EXE. The packaged files are written to a work directory upon EXE execution and the primary batch file is invoked.